Trust – one of the hardest things to earn but the easiest to lose. Mark and I have both been challenged to evaluate the level of trust in our marriage. Trust is built during the mundane moments of everyday life through kept promises. In his book What Did You Expect: Redeeming the Realities of Marriage, Paul Tripp says this about trust. Trust is being so convinced that you can rely on the integrity, strength, character, and faithfulness of another that you are willing to place yourself in his or her care (page 138). 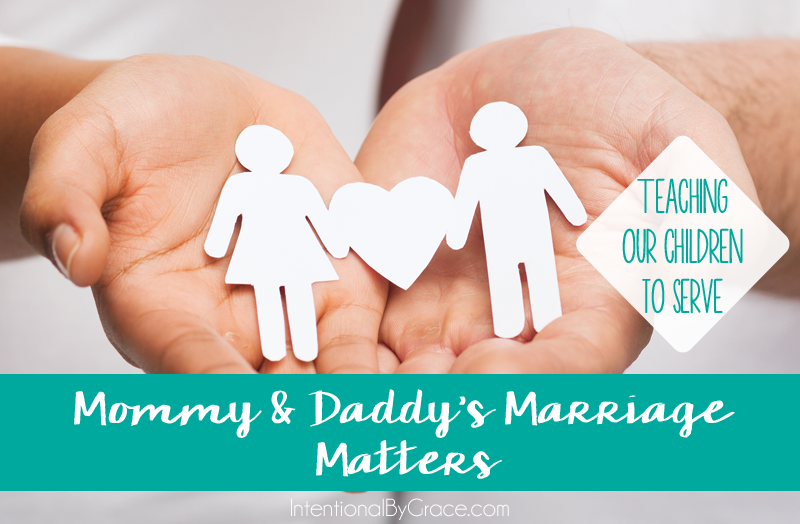 We must be intentional in our efforts to instill trust in our marriages. We must not take trust for granted for it is a stepping stone to gospel living and gospel proclamation. 1. Failing to keep our promises. This one seems obvious enough, but it’s interesting to me how easily I compartmentalize this truth into a box consisting of only the big things like marriage fidelity or finances. However, we must consider the little moments throughout the day that we’re either allowing to build up our marriage or tear it down. If I say I am only going to write for an hour, and I go on for two, that says to Mark that my writing and my desires mean more to me than pleasing him. It is in these little moments that we are being exposed – our motives, desires, and character. Can your spouse trust you to do what you say you are going to do when you say you are going to do it? We either emulate faithfulness and trustworthiness, or we don’t. 2. Failing to guard our tongues … and ears. Oftentimes, we put a lot of emphasis on the tongue, and how we speak – as we should, of course. However, I think it is equally important for us to consider our ears, and whether or not they encourage trust in our marriage. You tend to trust people who care about you enough to listen to what you have to say and who have demonstrated to you that they are committed to respond to what they have heard with words and actions (page 142). Leigh Ann: Are you listening to me? Mark: Yes, you said XYZ. I heard every word you said. Leigh Ann: Well, Mark, I don’t want you to just hear me; I want you to talk back to me. If I just wanted something to listen to me, I would just go talk to the wall over there. Communication takes two people. Good communication is important for building trust in a marriage. Are you willing to stop what you are doing to look at your spouse and respond to your spouse when they are talking to you? Can your spouse trust that you will engage with him or her and share his or her passions and dreams? 3. Failing to make God our number one priority. Consequentially, building trust between you and your spouse begins vertically before it ever begins horizontally. God has never betrayed you, hurt you, yelled at you, lied to you, or failed to keep His promises in any way. If you don’t desire to love Him and serve Him faithfully, how can you love your spouse or children in a way that encourages trust? When Mark consistently rises early to meet with the Lord, submitting to his leadership is made easier for me. It builds trust that Mark has our family’s best interest at heart because he is emulating to me submission to God and His will. Additionally, his love for God grows, and inevitably my love for God is encouraged. Together we are growing closer to God; therefore, we grow closer together. Trust is built and forged on the solid rock of the Gospel of Jesus Christ! God desires for us, as husband and wife, to live as “one flesh.” For children to see Mommy and Daddy in this light – vulnerable, naked and not ashamed – makes the Gospel attractive. Trust is being so convinced that you can rely on the integrity, strength, character, and faithfulness of another that you are willing to place yourself in his or her care. As examples of Christ and the church, let us be intentional to build and maintain trust in our marriages so that our children can see and understand the integrity, strength, character, and faithfulness of Christ. Let us do this so that they may entrust themselves to the sovereign care of our God and believe in the name of Jesus Christ. 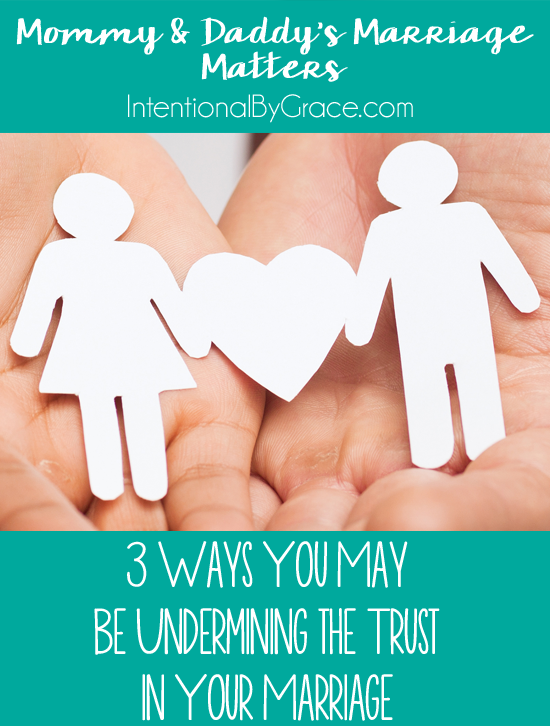 In what ways are your actions or words undermining the trust in your marriage? What is one thing you can do today to show your spouse that he/she can trust you? Tell us in the comments as a way to hold yourself accountable to follow through. What is Our Hope for Change? Want to take the 21-Day Prayer Challenge for Your Marriage? Sign up here!